-Surface is smooth blacktop, however, there are a few light poles (not an issue as they are far apart), and there is also a little elevation change, overall about 3-4'. -Course will be set up for best time not for drifting (i.e., any loss of traction will result in a slower time). *Everyone entering the Autocross Location will be required to sign a waiver. If you are under 18, you must have a parent/guardian with you to sign waiver. There is no wiggle room on this. Property owner and insurance company are requiring it. *No one under the age of 18 will be allowed in a car on the course. -After the main event Volvo drivers are all finished, we may sell laps (for Volvos only) to run the course for charity time dependent). -Must be 18 years old or older to register as a driver or passenger. -Everyone entering the Autocross Location will be required to sign a waiver. If you are under 18, you must have a parent/guardian with you to sign waiver. SNELL / ANSI APPROVED HELMET FOR EACH DRIVER AND PASSENGER. If you have any spare helmets, please bring them with you on the day of the event! secured battery, no hubcaps, nothing loose in the interior or trunk (cameras, tools, etc. ), car in general good working condition, working seatbelts, no massive leaks, no fuel leaks, no bald tires, etc. -Valid Drivers License and current car insurance card (checked at gate). -Suncreen / shade devices (pop-up tents, hats, etc. )/folding chairs, etc. -Clean up after yourself, etc. -We are planning on 4 runs per group, with a group of beginners and a group of experienced drivers. -If time allows we may choose to offer addition runs with donations towards charity, but this is time- dependent. -Food will not be provided. -Volunteers may be needed to run the course while the other group is out. -All runs will be timed with the option of the worst run to not be counted on your overall average. -We need numerous volunteers to make this work. Cone retrieval experts especially needed as well as event set-up (April 26 evening) and take down (right after the event ends). -Sacramento Chapter President Mark Baldwin will be running the Auto-X and hosting the rehab after at his beautiful facility just a few miles away from the Auto-X. *The tint shop next to my shop will be open during the AutoX Rehab Party and will offer tinting for most Volvos at $110. This will include back window, rear door windows, and 2 small rear windows. Prices will be more to add front side windows or to remove old tint etc. This is a great deal as this guy really knows what he is doing. First come, first served. Let me know if you are planning on getting your sled tinted. The tint guy trying to figure out how many of his guys to keep on that evening. *There MIGHT also be a corner-weight setup if I can get him on-board. will be closing Thursday, April 25, 2013 at 9 p.m. Pacific. Thursday, April 25, 2013 at 9 p.m. Pacific. car on display for everyone else to admire!" IPD and the 30th anniversary of the VCOA! First Shift: 7:00 a.m. to 10:30 a.m.
First Shift: 7 a.m. to 8:30 a.m.
Second Shift: 8:30 a.m. to 10:15 a.m.
Third Shift: 10:15 a.m. to 11:45 a.m.
Fourth Shift: 11:45 a.m. to 1:30 p.m. If you have any questions or are interested in volunteering, please e-mail Jon Manji and let him know the post and shift that you want. 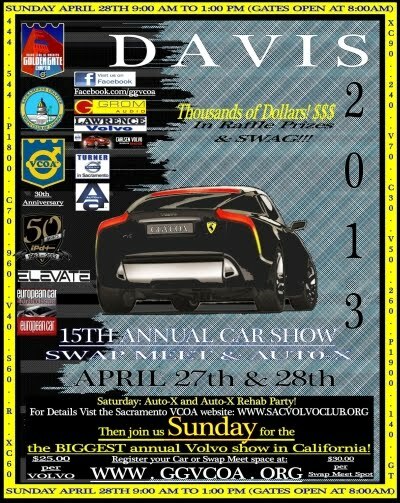 Three landmark anniversaries coincided for this year’s Davis Meet: the Car Show and Swap Meet celebrated its 15th year, VCOA its 30th year, and ipd, a long time show sponsor, its 50th year. The April 27-28th weekend was warmer than usual for California’s Central Valley. The heat was not unwelcome, however, as it provided better traction for the autocross drivers on Saturday and there was ample shade under the park pavilion and trees on Sunday. The Davis Meet Weekend traces its origins back to 1999 when the newly formed North Bay Chapter, now Golden Gate Chapter (GGVCOA), needed to find a new venue for their annual spring meet after their previous location, the Nut Tree restaurant in Vacaville, CA closed its doors in the late 1990s. Michael Peterson, a Davis resident and longtime VCOA member, suggested Davis Central Park as an ideal spot to host the event due to its location and facilities. The City of Davis is located 75 miles northeast of San Francisco and 15 miles west of Sacramento and has a small college town feel that is Volvo-community-friendly as many Volvo owners live and work there. Davis Central Park, home to the award winning Farmer’s Market, is located in downtown Davis, near the University of CA campus, where the thriving restaurant scene and business district are within walking distance on pedestrian friendly, tree lined streets. The park has so many amenities that the North Bay Planning Committee immediately recognized its value and it has been serving us well ever since: A permanent metal pavilion that provides cool shade on sunny days and shelter on rainy days, lots of paved areas for parking, a play structure for the children, a fountain area with benches to relax on, a large grass area to utilize, many trees for shade, and perhaps most important of all, permanent bathrooms. As the event has grown, the Davis Parks Department has allowed us, starting in 2003, to close down the street, and, this year, to park on the grass in addition to the paved areas. Over the years, we have been able to grow into the park and the park has always met our needs. The (Sacramento) Davis Autocross, while a newer addition to the Davis Meet Weekend at four years, actually traces back to 2002 when Keith Soreng, then GGVCOA treasurer, suggested adding a Thunderhill Track Day to the event. When this became too expensive, the Autocross was added in 2010 at Mark Baldwin’s suggestion. Mark is now president of the Sacramento Chapter (SacVCOA) as well as the Autocross event manager. Mark set the charitable tone of the event from the beginning— proceeds after expenses are donated to charity. Donations have been made to the preferred charity of the person helping to secure the Autocross location. This year, the designated charity is the Rancho Cordova Police Activities League (http://www.rcpdpal.com/), a youth crime prevention program which fosters relationships between youth and police officers in the community through activities and sports programs. The Autocross Rehab Party began in 2011, as a way to relax after a day of friendly competition, fix any car-related issues, prepare for the next day’s car show, and meet everyone. Over the past two years, it has evolved to continue the charitable goals of the Autocross event by including a charity car smash and professional car-related services at discounted rates with the goal of generating more donations for the selected charity. The SacVCOA hosted the 4th Annual Autocross on Saturday, April 27 at a new nine acre location in Rio Linda, CA, just north of Sacramento. Finding an Autocross location proved difficult this year as many locations are no longer allowing Autocross events on their properties and took every connection in SacVCOA President Mark Baldwin’s and SacVCOA member Gary Sellstrom’s address book to find a local site. Through perseverance, this location was secured and we hope to secure this site for future events as it provides opportunity for growth. The new lot has about three to four feet of elevation change and some light poles spread far apart to work around. As a result, the final course design emphasized best time, rather than drifting, and equalized the horsepower versus handling equation by including a lot of connected curves of various length, direction, and radii as well as a slalom to challenge the driver’s skill while keeping things safe. Sixteen drivers, ranging from novice to expert, competed in two groups, driving Volvos ranging from 240s to a C30. To achieve the best time of the day, the drivers were allowed eight one-lap runs going through the course—four runs in the morning going through the course from start to finish; the direction was reversed for the four runs in the afternoon. Afterwards, everyone caravanned to Mark Baldwin’s beautiful facility, just a few miles away, where he hosted the 3rd Annual Autocross Rehab Party. This year’s Rehab party included a portable chassis dyno, window tinting, car wash area, available equipment to assist with any repairs or mishaps from the day, music, catered BBQ dinner, a Disney Pixar “Cars” themed cake, and a Kia, donated by Jessica and Mike Arce, owners of Fast Response Towing in Rancho Cordova, for the engine blow, attempted airbag deployment (unsuccessful), and car smash charity fundraiser that also benefited the Rancho Cordova Police Activities League. On Sunday, April 28, the GGVCOA and SacVCOA co-hosted the highly anticipated 15th Annual Davis Car Show and Swap Meet— an event that exceeded expectations and broke all previous records. When the count was taken late in the day, there were 156 cars inside the park and 50 cars outside the park. The number of sponsors, contributions, and swap meet participants also exceeded past years. The energy behind all this comes from the vision of Justin Lee, the new GGVCOA President the guiding hand of event manager/SacVCOA Planning Committee member Jon Manji, and the inter-chapter team of GGVCOA/SacVCOA Planning Committee members, members, and volunteers. Over the years, the show has grown from a local get-together to a premier event drawing people from all over the West Coast, Nevada, and Arizona, with this year’s longest distance traveled nominees being from Idaho and Pennsylvania. As the show has grown, it has retained its small town charm as old friends catch up and new friends are made over a shared interest in Volvos. Whether you come to share restoration or modification progress, seek part resources, or just “talk Volvo,” whatever your needs, you are likely to find the answers you seek at the Davis Car Show and Swap Meet. As an added bonus, the Park was double booked with the Davis Flea Market and Music on the Green again this year, further increasing the community feel and interaction of the Davis, student, and Volvo communities. Doubling the venue size by allowing parking on the grass has two additional benefits: it allows different set-up arrangements and the natural surface helps keep the cars and people cool on warm days. Sponsors and swap-vendors lined both sides of the street for a block. Cars filled the paved areas under the pavilions, the fountain area, in front of the stage, and the new grass area. In fact, Volvos filled all areas of the park and surrounding city streets. -Michael Peterson was recognized as the Davis Car Show Event Founder and for his service as event liaison with the City of Davis City Parks. -Jon Manji was recognized for serving as the Davis Car Show Event Manager. -Jeff Molander was recognized for his leadership as Sac Volvo Club as President from 2008-2010. This year, the sponsors supported the show in a number of ways: from sponsoring People’s Choice Award categories, to contributing raffle prizes and swag gifts, and bringing display cars and/or setting up display booths at the show, it was a great way for the Volvo enthusiast community to see their latest offerings and meet the people behind these companies. -Elevate, a performance and style parts manufacturer for Volvos, sponsored two People’s Choice award categories, brought their 2008 C30 T5 project car, and donated a number of raffle and swag items, the most looked forward to item being a silver performance air inlet manifold designed for T5 engines, valued at $695. -Ipd, a Volvo parts and accessories specialist, sponsored three awards, set up a booth and displayed their 2004 V70R project car at the show, as well as donated a number of raffle and swag items, the most talked about items being the engine electronic control unit (ECU) flash tune upgrade valued at $695 and the sway bar kit valued at over $300. -Polestar, official Volvo racing and performance partner since 1996, donated a Volvo Cars North America approved Polestar tune available for a number of new and late model Volvos, valued at over $1,000. All three local Volvo dealerships: Turner, Carlsen, and Lawrence, offered for the winner to be able to install the tune for free. The sponsor’s support for the show was amazing, unprecedented, and record-breaking. All told, the Davis Car Show and Swap Meet was able to give away nearly $10,000 in raffle prizes and swag thanks to the generous support of the sponsors. Thank you to the numerous sponsors and volunteers who helped staff and support the Autocross and Car Show as well as to everyone who attended this year’s event and made it such a great weekend! The 2014 Davis Meet is tentatively scheduled for Sunday, April 6, 2014. The Autocross date will be confirmed once the venue has been chosen. Save the date: Next year’s Autocross will be on Saturday, April 5th and the Davis Car Show and Swap Meet will be on Sunday, April 6, 2014. The National Anthem is sung before the start of the 2013 Autocross. 2013 Sacramento (Davis) Autocross Group Photos. Photos by Colin Clark. Click on photos to see original in new tab/window. Link to Colin Clark's entire event photo album can be found below. 2013 Autocross videos are being processed/uploaded to YouTube. The spreadsheet on this webpage automatically updates with any changes (you may need to refresh the page to see the changes).